Liverpool started off their home Premier League campaign with a less than convincing win over newly-promoted Bournemouth, aided by a controversial debut Anfield goal for summer signing Christian Benteke. The Reds named an unchanged eleven from last weekend’s win over Stoke City, while Eddie Howe effected two changes in his Bournemouth side, bringing in Eunan O’Kane and Max Gradel for Dan Gosling and Marc Pugh respectively. Liverpool lined up in their customary 4-2-3-1; Adam Lallana’s position was more central while Philippe Coutinho started on the right. Jordan Henderson and James Milner formed the central midfield pairing, with Henderson sitting slightly deeper than Milner. Joe Gomez kept his place on the left side of defence, forming part of a four man back line alongside Dejan Lovren, Martin Skrtel and Nathaniel Clyne. Gomez was restrained in his forward movements, and offered little support to left winger Jordon Ibe. There were plenty in-game formation morphs, evident particularly after the Reds took a 26th minute lead as they sat back and waited for counter attacking opportunities in a 4-4-1-1 shape. While Emre Can‘s introduction in the second half allowed them to change into 4-1-4-1. Bournemouth played with a double pivot of O’Kane and Andrew Surman to negate the threat of Coutinho, perhaps a reason why Brendan Rodgers did not start with the Brazilian centrally. The Cherries were brave to not flood their midfield, instead opting for two forwards, Callum Wilson and Josh King. Matt Ritchie was the obvious offensive threat for the Cherries cutting inside from the right, while his team-mate on the opposite flank, Gradel, had to balance offensive and defensive responsibilities as Liverpool attacked mostly through their right. Last weekend against Stoke City, Liverpool were found wanting in areas in front of their defence as Henderson failed to impose himself in a deep-lying role. The Reds captain once again sat as the holding midfielder, only this time he was more disciplined although fundamental problems were still evident. Due to the positioning of King in the space between Liverpool’s defence and midfield lines, Henderson shadowed the Norwegian. However, his lack of nous as a marker of men was found out but Bournemouth failed to take any real advantage of the Reds’ weakness in midfield. Henderson’s midfield partner, Milner, played slightly right of centre and helped in Liverpool’s combination plays on the right flank with Clyne and Coutinho. 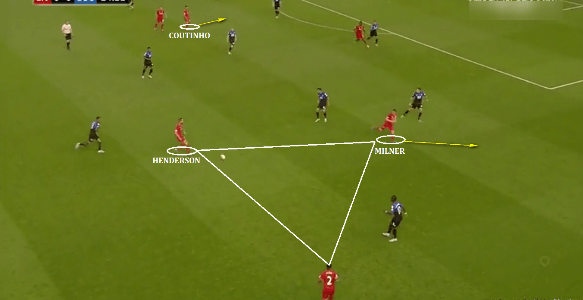 When Coutinho drifted infield, Milner would momentarily occupy his position, thus allowing the Reds to form passing triangles. While combination play thrived on the right with Milner, Clyne and Coutinho, the same could hardly be said about the left flank. Jordon Ibe had a frustrating night of football, hardly influencing proceedings as he was isolated and then overloaded on the outside left by Bournemouth. Ibe had little to no support from left-back Gomez, and with Lallana visibly out of touch, Liverpool had a sense of imbalance about the way they attacked. Lallana had an average game by his standards; he often lacked conviction in his movements and tended to slow the game down by keeping the ball longer than expected. After Benteke’s goal, which should have been disallowed, Liverpool dropped deeper as Bournemouth’s lines slid forward. This forced the Reds to adopt an approach to counter attack at every opportune moment. Coutinho loosely positioned himself in line with Surman and O’Kane, which allowed for better chances on the break for the home side. 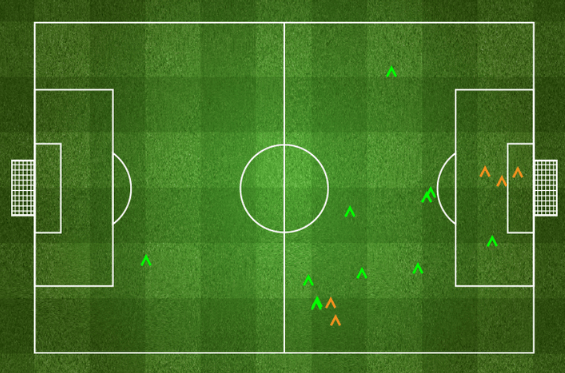 Coutinho drifted inside from the right on numerous occasions, although he was essentially a wide midfielder. The Brazilian’s free role meant Bournemouth had trouble containing interplay on Liverpool’s right hand side, which also involved Milner and Clyne. Can’s second substitute appearance of the season when he replaced Henderson in the 50th minute made Liverpool more symmetric in their set-up. They were primarily playing a distorted midfield before Can came on; the German allowed the Reds to a balanced 4-1-4-1 shape with Coutinho and Milner interchanging effortlessly. Can sat in the “6” space unlike Henderson, who likes to move forward in attacking phases, and put in a solid shift defensively, keeping the Cherries at bay for almost the entirety of the second half. The following diagram from FourFourTwo shows the 21-year-old’s tackles and interceptions in the central areas which were all successful. Another of Liverpool’s tactics was to maximize the aerial threat of Benteke. The Belgian won 69% of the aerial duels he was involved in, as the Reds sought to find him regularly from the back. Most notably Skrtel and goalkeeper Simon Mignolet, who regularly punted long for Benteke with Coutinho and Lallana on hand to link up with the Belgian. Although the Reds failed once again to fully utilise one of Benteke’s primary strengths, they had the plan in place, only to be disappointed by the quality of supply to their centre-forward. In the above screenshot, Milner attempts an early cross sensing the potential advantage Benteke has over centre-back Tommy Elphick with Steve Cook out of position. Luckily for Bournemouth, Milner sends an ordinary ball straight onto Cook’s head. Liverpool’s pressing scheme was zone oriented, and they started by spatially covering to disrupt Bournemouth’s pass-oriented build-up from the back. The following scenario from the second minute illustrates the Reds’ initial pressing scheme. Lallana goes semi-aggressive on right-back Francis, while Ibe closes down Ritchie, thus cutting off Francis’ passing option. Without much choice, Francis sends a long ball into the deep right channel. 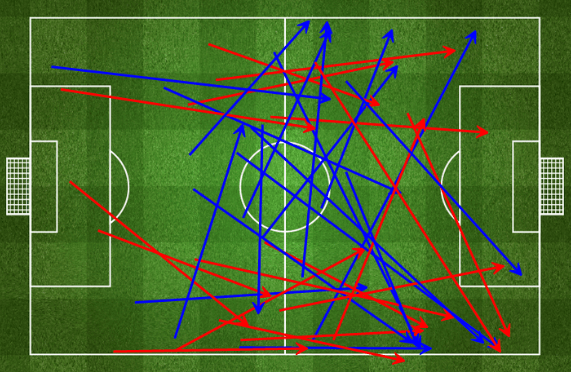 Thus, Liverpool stop Bournemouth from building up through short passing combinations. Another instance shows the Reds weren’t focussed on specifically covering men. They tried to cut passing lanes and stop Bournemouth from building play. In the scene below, Ibe tries to close Francis down which leaves the right-back with no other choice but to send another long ball through the flanks. As mentioned earlier, the Cherries were brave enough to field two forwards, which was logical given Liverpool lack control in their midfield zone. Their covering scheme was man oriented, and Surman and O’Kane rarely moved forward from their deep positions initially. 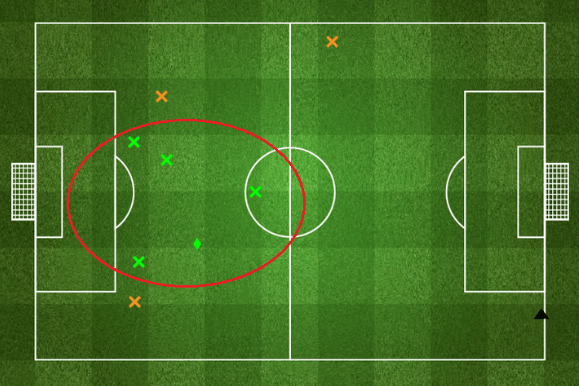 Gradel and Ritchie covered their opposing full-backs and tracked them inside their own half as well. Ritchie, in particular, had more time on the ball owing to Gomez’s lack of support for Ibe on the left flank, and he was able to use his impressive passing range to seek out quick switches of play through diagonal balls. Bournemouth’s tactics involved a lot of diagonal play-switching long balls which aimed at isolating one of the Liverpool full-backs. Their 4-4-1-1 set-up remained consistent throughout, and off the ball indentations followed the ball. In the above diagram, notice the significant amount of long, diagonal balls Bournemouth played to switch play from one flank to another. 11 out of the 18 successful long balls were diagonals into the deep channels on either flank. They kept a tight line at the back, and regrouped well in transitions. When Coutinho penetrated the space between the lines with the ball, seeking a defence splitting pass, the Bournemouth defenders positioned themselves well to cut off potential passes to Benteke. In the above situation, notice Bournemouth’s tight line to prevent Coutinho from passing into an area inside the box. The players around the Brazilian are aware of his threat and have already started to close him down, while the markers for Benteke and Lallana are in close watch of their respective men. They tried to use their advantageous position of playing two forwards which facilitated plenty of runs into the channels from balls supplied from inside their own half, which they couldn’t really capitalise on, thus exposing their lack of quality up front. As they chased the game in the second half, Bournemouth employed a high-medium block press to unsettle the Liverpool full-backs. O’Kane and Surman took turns to support the press on either side, which was strategic as well. When O’Kane supported the press from the right side by Ritchie on Gomez, Gradel in the passive area dropped deep in support of Surman, thus maintaining the balance in midfield. In the above scene, Gradel drops into the central area as O’Kane moves forward in support of Ritchie who is about to aggressively press Gomez. Liverpool kept their second clean sheet in succession, thanks in no small part to a confident Mignolet and the disciplined duo of Skrtel and Lovren. The centre-backs were ably supported by the two full-backs. While Clyne attacked and defended with equal aplomb, Gomez rarely motored forward to support Ibe. Given Gomez is a centre-back by trade and the fact he was up against the plucky Ritchie, his defensive-minded approach was understandable. Overall, the Reds were organised although there were occasional uncomfortable moments during which Bournemouth’s lack of quality up front let them off the hook. The above scene is from the second minute when Clyne was caught ahead of the ball while trying to press Gradel, leaving Daniels with acres of space ahead. Notice Skrtel and Lovren sticking tight to Wilson, while Gomez is on hand to check King’s run into the box. Thus Liverpool have covered all potential goal threats inside the box. Bournemouth’s pressure in the final quarter hour made for a tense finish for the home side, although much of it was of the Reds’ own making. Liverpool dropped deeper and deeper which encouraged Bournemouth’s forwards to move into areas closer to the Liverpool goal, which in turn allowed them to dictate play near the 90 minute mark. In the above heat maps courtesy of Squawka, the difference in the action areas of Liverpool’s central trio of Can, Skrtel and Lovren is noticeable. Taking two comparable time frames (65-80 minutes and 80-90+4 minutes) under consideration, we can see Liverpool dropped deeper which allowed Bournemouth access to areas closer to the goal, hence inviting pressure in the dying stages. Liverpool barely deserved the win, although Bournemouth’s significant lack of quality in attack left them ruing two controversial calls and a host of promising openings. Diagonal switches of play was one of the notable features of their approach, as was their use of wingers to hinder the attacking movements of Liverpool’s full-backs. The Reds were once again found wanting at the base of midfield, although Can’s arrival after half-time brought about a more calming influence. While Coutinho’s link-up play on the right with Milner and Clyne looked promising, Liverpool seemed determined to make Benteke’s aerial game a more prominent aspect of their overall game plan.